Is it always true that the molecules of a dense liquid are heavier than the molecules of a lighter liquid? Density is defined as mass per unit volume. It tells how closely packed are the molecules inside an object. When molecules are tightly packed, we say that the object is dense; when molecules are far apart, we say that the object is light. The density of a liquid depends on the mass of the molecules that make up the liquid and the closeness of the molecules of the liquid. It is not always true that the molecules of a dense liquid are heavier than the molecules of a lighter liquid. For example, alcohol is less dense than oil. Alcohol molecules are mostly carbon and hydrogen atoms, so they are similar to oil. But they also contain an oxygen atom, which makes them a little heavy. For this reason, you might think that alcohol is denser than oil. But because of their shape and size, alcohol molecules do not pack as efficiently as oil molecules. This property of molecules makes alcohol less dense than oil. If someone presses a pointed needle against your skin, you are hurt. But if someone presses a rod against your skin with the same force, you easily tolerate. Explain. We know that pressure is the application of force over a particular area. In mathematical terms, pressure is equal to force divided by area; that is, with more force comes more pressure and with more area comes less pressure. An iron rod has more surface area than the pointed tip of a needle. That is why the pointed needle exerts more pressure than the iron rod (with the same force) when pressed against our skin. In the derivation of P1 − P2 = ρgz, it was assumed that the liquid is incompressible. Why will this equation not be strictly valid for a compressible liquid? In case of an incompressible liquid, the density is independent of the variations in pressure and always remains constant. But it is not so in case of a compressible liquid. Thus, the given equation will not be strictly valid for a compressible liquid. Suppose the density of air at Madras is ρo and atmospheric pressure is P0. If we go up, the density and the pressure both decrease. Suppose we wish to calculate the pressure at a height 10 km above Madras. If we use the equation Po − P = ρogz, will we get a pressure more than the actual or less than the actual? Neglect the variation in g. Does your answer change if you also consider the variation in g? The pressure calculated by using this equation will be more than the actual pressure because density at a height of 10 km above Madras will be less than ρo. Yes, the answer will change if we also consider the variation in g. Because g decreases with height, it will have the same effect on pressure as that of density. The free surface of a liquid resting in an inertial frame is horizontal. Does the normal to the free surface pass through the centre of the earth? Think separately if the liquid is (a) at the equator (b) at a pole (c) somewhere else. Yes, the normal to the free surface of the liquid passes through the centre of the Earth. Because of the gravitational force, the free surface of the liquid takes the shape of the surface of the Earth. Also, because the gravitational force is directed towards the centre of the Earth, the normal to the free surface also passes through the centre of the Earth (in all cases). A barometer tube reads 76 cm of mercury. If the tube is gradually inclined keeping the open end immersed in the mercury reservoir, will the length of mercury column be 76 cm, more than 76 cm or less than 76 cm? The length of the mercury column will be more than 76 cm. The pressure depends on the height of the highest point of the mercury from the ground and not on the length of the liquid column. A one meter long glass tube is open at both ends. One end of the tube is dipped into a mercury cup, the tube is kept vertical and the air is pumped out of the tube by connecting the upper end to a suction pump. Can mercury be pulled up into the pump by this process? No, mercury cannot be pulled up into the pump by this process. The level up to which mercury can rise is 76 cm (to maintain equal pressure at points A and B). A satellite revolves round the earth. Air pressure inside the satellite is maintained at 76 cm of mercury. What will be the height of mercury column in a barometer tube 1 m long placed in the satellite? geffective=0, so the pressure due to height of the mercury column will be zero. Consider the barometer shown in figure. If a small hole is made at a point P in the barometer tube, will the mercury come out from this hole? As the inward pressure is more, the mercury will not come out of the hole. Is Archimedes’ principle valid in an elevator accelerating up ? In a car accelerating on a level road? Archimedes’ principle is not valid in case of an elevator accelerating upwards, but it is valid for a car accelerating on a level road. The above principle is satisfied in case of a car accelerating on a level road. Thus, Archimedes’ principle is not valid in this case. Why is it easier to swim in sea water than in fresh water? Whether an object sinks or floats in a liquid depends upon the density of the two. We know that sea water has dissolved salts in it, which increase its density. So, sea water exerts more buoyancy force (in the upward direction) on the swimmer than that exerted by fresh water. This helps the person to swim easily in sea water compared to fresh water. A glass of water has an ice cube floating in water. The water level just touches the rim of the glass. Will the water overflow when the ice melts? The water of mass equal to the mass of the ice cube will take less volume compared to the ice cube. The water will not overflow when the ice melts because the ice will displace the space it would take if it were in a liquid state. A ferry boat loaded with rocks has to pass under a bridge. The maximum height of the rocks is slightly more than the height of the bridge so that the boat just fails to pass under the bridge. Should some of the rocks be removed or some more rocks be added? Some rocks should be added to increase the force acting in the downward direction. It will help the boat to pass under the bridge. If some rocks are removed, the upthrust of water on the boat will be greater than the weight of the boat. So, the boat will rise in water and will fail to pass under the bridge. Water is slowly coming out from a vertical pipe. As the water descends after coming out, its area of cross section reduces. Explain this on the basis of the equation of continuity. Let a be the area of cross section and v be the velocity of water. v α 1aIt means the larger the area of cross section, the smaller will be the velocity of liquid and vice versa. Thus, as the water comes out of the vertical pipe, its velocity increases and area of cross section decreases. While watering a distant plant, a gardener partially closes the exit hole of the pipe by putting his finger on it. Explain why this results in the water stream going to a larger distance. According to the equation of continuity, if the exit hole of the pipe is partially closed, the water stream comes out with more velocity due to decrease in area. This results in the water stream going to a larger distance. A Gipsy car has a canvass top. When the car runs at high speed, the top bulges out. Explain. This can be explained through Bernoulli’s principle, which states that the higher the air speed, the lower the pressure in that area. Because the air inside the car does not move, the pressure in the car is atmospheric. Because air moves outside the car (directly above it), the pressure is low. The canvas top of the Gipsy car is pushed upwards because the pressure inside the car is greater than the pressure directly above the car. The forces between the particles of a solid are stronger than those between the particles of a liquid, so the particles cannot move freely but can only vibrate. Thus, a solid has stable, definite shape and volume. A solid can only change its shape by force (when broken or cut), whereas a liquid can easily change its shape because of weak inter-particle forces. P=lim∆s→0F∆S. It is independent of the acceleration of the elevator. Here, acceleration a0 (say) due to elevator accelerating upwards is also taken into account. F=P0+hρgwhere P0 is atmospheric pressure, is maximum. In the question, the masses are equal. So, the force on the base is the same in all cases. At both points A and B, pressure is equal to atmospheric pressure. As the air inside the jar is pumped out, the air pressure decreases. Thus, the pressure in the liquid near the bottom of the beaker decreases. The two points in the same horizontal line will not have equal pressure if the liquid is accelerated horizontally. There should be vertical acceleration. Suppose the pressure at the surface of mercury in a barometer tube is P1 and the pressure at the surface of mercury in the cup is P2. The upper part of the tube contains vacuum as the mercury goes down and no air is allowed in. Thus, the pressure at the upper end, i.e., at the surface of mercury in a barometer tube is zero (P1 = 0). However, the pressure at the surface of mercury in the cup or any another point at the same horizontal plane is equal to the atmospheric pressure. If the elevator goes up at an increasing speed, then the effective value of g increases. P=ρghSo, h will have a lesser value for the same value of P if g increases. When the elevator is going upwards with acceleration a, the effective acceleration is a’ = (g + a). P=h’ρgBecause the pressure is the same, h’ > h.
Because of the trapped air, the pressure at the upper end of the mercury column inside the tube is not zero. When more air is pushed into the bottle from the pump, the pressure of air increases on the wood as well as on the water surface with the same amount. So, the level of water and wood does not change. Thus, the piece of wood floats with the same part in the water. In the absence of water, the force acting on the bottom of the vessel is due to the air and the cube. Now, when water is filled in the vessel, the force due to the water and the cube is greater. The extra force is balanced by the buoyant force acting on the cube in the upward direction. A wooden object floats in water kept in a beaker. The object is near a side of the beaker. Let P1, P2, P3 be the pressures at the three points A, B and C of bottom as shown in the figure. If the fluid is in equilibrium, then the pressure is the same at all points in the same horizontal level. When the box is accelerated towards right, the water in the box experiences a pseudo force (ma) towards left, where m is the mass of water. So, the resultant normal force by the water on the top of the box passes through a point to the left of the centre. Consider the situation of the previous problem. Let the water push the left wall by a force F1 and the right wall by a force F2. When the box is accelerated towards right, the water in the box experiences a pseudo force (ma) towards left, where m is the mass of water. So, the force F1 exerted by the water on the the left wall of the box is greater. This happens in accordance with the equation of continuity. As the area of the cross section of cylindrical tube AB is constant, the velocity of water will also be the same. The equation is derived from the principle of conservation of mass and it is true for every case, i.e., when the tube is either horizontal or vertical. The principle behind the Bernoulli theorem is the law of conservation of energy. It states that energy can be neither created nor destroyed; it merely changes from one form to another. Water is flowing through a long horizontal tube. Let PA and PB be the pressures at two points A and B of the tube. (a) PA must be equal to PB. (b) PA must be greater than PB. (c) PA must be smaller than PB. (d) PA = PB only if the cross-sectional area at A and B are equal. (d) PA = PB because the cross-sectional areas at A and B are equal. According to Bernoulli’s theorem, pressures at points A and B of the horizontal tube will be equal if water has the same velocity at these points. Also, according to the equation of continuity, velocity at points A and B will be equal only if the cross-sectional areas at A and B are equal. So, PA = PB only if the cross-sectional areas at A and B are equal. Water and mercury are filled in two cylindrical vessels up to same height. Both vessels have a hole in the wall near the bottom. The velocity of water and mercury coming out of the holes are v1 and v2 respectively. The velocity of efflux does not depend on the density of the liquid. It only depends on the height h (given same in the question) and acceleration due to gravity g (constant value here). A large cylindrical tank has a hole of area A at its bottom. Water is poured in the tank by a tube of equal cross-sectional area A ejecting water at the speed v.
(c) The water level will rise to a height v2/2g and then stop. v2=2gh⇒h=v22gSo, h is the maximum height up to which the water level will rise if the water is ejected at a speed v.
A solid floats in a liquid in a partially dipped position. (a) The solid exerts a force equal to its weight on the liquid. (b) The liquid exerts a force of buoyancy on the solid which is equal to the weight of the solid. (c) The weight of the displaced liquid equals the weight of the solid. (d) The weight of the dipped part of the solid is equal to the weight of the displaced liquid. According to Archimedes’ principle, any object, wholly or partially immersed in a fluid, is buoyed up by a force equal to the weight of the fluid displaced by the object. Also, any floating object displaces its own weight of fluid. Thus, we can say that the weight of the object is equal to the weight of the fluid displaced. The surface of water in a water tank on the top of a house is 4 m above the tap level. Find the pressure of water at the tap when the tap is closed. Is it necessary to specify that the tap is closed? It is necessary to specify that the tap is closed because if the tap is open, then the pressure gradually decreases as h decreases and also because the pressure in the tap is atmospheric. The heights of mercury surfaces in the two arms of the manometer shown in figure are 2 cm and 8 cm. Atmospheric pressure = 1.01 × 105 N−2. Find (a) the pressure of the gas in the cylinder and (b) the pressure of mercury at the bottom of the U tube. Let pg be the pressure of the gas. If we consider both limbs, then the pressure at the bottom of the tube will be the same. The area of cross section of the wider tube shown in figure is 900 cm2. If the boy standing on the piston weighs 45 kg, find the difference in the levels of water in the two tubes. Let h be the difference in the levels of water in the tubes and pa be the atmospheric pressure. A glass full of water has a bottom of area 20 cm2, top of area 20 cm2, height 20 cm and volume half a litre. (a) Find the force exerted by the water on the bottom. (b) Considering the equilibrium of the water, find the resultant force exerted by the sides of the glass on the water. Atmospheric pressure = 1.0 × 105 N m−2. Density of water 1000 kg m−2 and g = 10 m s−2. =pa×A+A×h×ρw×g=Aρa+hρwg=20×10-4105+20×10-2×103×10=204 N(b) Let Fâ€‹s be the force exerted by the sides of the glass. Now, from the free body diagram of water inside the glass, we can find out the resultant force exerted by the sides of the glass. Suppose the glass of the previous problem is covered by a jar and the air inside the jar is completely pumped out. (a) What will be the answers to the problem? (b) Show that the answers do not change if a glass of different shape is used provided the height, the bottom area and the volume are unchanged. When the glass is covered by a jar and the air is pumped out of the jar, atmospheric pressure has no effect on the glass. =20×10-2×103×1020×10-4=4 Nb mg=h×ρw×g×A+Fs⇒Fs=5-4=1 N(c) If we use a glass of different shape with same volume, height and area, then there will not be any change in the answer. If water be used to construct a barometer, what would be the height of water column at standard atmospheric pressure (76 cm of mercury)? The weight of an empty balloon on a spring balance is W1. The weight becomes W2 when the balloon is filled with air. Let the weight of the air itself be w. Neglect the thickness of the balloon when it is filled with air. Also neglect the difference in the densities of air inside and outside the balloon. According to the question, the density of air inside and outside the balloon is the same. So, the weight w of air inside the balloon is equal to the weight of displaced air. Thus, the spring balance will not register any difference because the balloon will experience buoyant force equal to w that cancels out the weight of the added air. (d) be in the vertically upward direction. The force exerted by the liquid on the solid is the vertically upward force (buoyant force) that opposes the weight of the immersed solid.â€‹ As more and more volume of the solid is immersed in the liquid, the buoyant force increases. Buoyant force depends on the weight of the displaced liquid. So, maximum upward buoyant force acts on the solid when it is completely immersed in the liquid. It decreases if the solid is taken partially out of the liquid. Once the object is immersed in the liquid, then pushing it further in the liquid does not increase the buoyant force. A closed vessel is half filled with water. There is a hole near the top of the vessel and air is pumped out from this hole. (a) The water level will rise up in the vessel. (b) The pressure at the surface of the water will decrease. (c) The force by the water on the bottom of the vessel will decrease. As air is pumped out of the hole, there is a decrease in the atmospheric pressure above the water surface in the vessel. Due to this, pressure at the surface of the water decreases. Thus, the force exerted by the water on the bottom of the vessel also decreases. 12mv2) and momenta (mv) of all particles arriving at a given point are the same, as the mass of a particle is constant. Water flows through two identical tubes A and B. 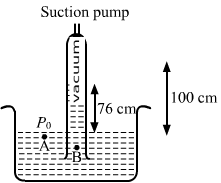 A volume V0 of water passes through the tube A and 2 V0 through B in a given time. Which of the following may be correct? (a) Flow in both the tubes are steady. (b) Flow in both the tubes are turbulent. (c) Flow is steady in A but turbulent in B. (d) Flow is steady in B but turbulent in A. In a steady flow, the velocity of liquid particles reaching a particular point is the same at all times, but if the liquid is pushed in the tube at a rapid rate, i.e., if the flow rate increases, then the flow may become turbulent. Here, the flow rate is the volume of fluid per unit time per unit area flowing past a point. Large volume of water passes through tube B compared to tube A. Thus, the flow rate is greater in tube B than in tube A. So, if the flow is turbulent in A, then the flow in B cannot be steady. Therefore, the first three options are possible. Water is flowing in streamline motion through a tube with its axis horizontal. Consider two points A and B in the tube at the same horizontal level. (a) The pressures at A and B are equal for any shape of the tube. (b) The pressures are never equal. (c) The pressures are equal if the tube has a uniform cross section. (d) The pressures may be equal even if the tube has a nonuniform cross section. In streamline flow in a tube, every particle of the liquid follows the path of its preceding particle and the velocity of all particles crossing a particular point is the same. However, the velocity of the particles at different points in their path may not necessarily be the same. Thus, by applying Bernoulli’s theorem and equation of continuity, we can say that if the tube has a uniform cross section, the pressures will be equal; and if the tube has a non-uniform cross section, the pressures may or may not be equal. v=2ghHere, g is acceleration due to gravity and h is height of the liquid from the hole. Thus, it is clear from the above relation that the speed of the liquid depends on the height of the liquid from the hole and on the acceleration due to gravity. It does not depend on the area of the hole and the density of the liquid. Find the force exerted by the water on a 2 m2 plane surface of a large stone placed at the bottom of a sea 500 m deep. Does the force depend on the orientation of the surface? F=P×A=hρw×gA P=Pressure⇒F=500×103×10×2 =107 N/m2The force does not depend on the orientation of the rock when the surface area of the stone remains the same. Water is filled in a rectangular tank of size 3 m × 2 m × 1 m. (a) Find the total force exerted by the water on the bottom surface on the tank. (b) Consider a vertical side of area 2 m × 1 m. Take a horizontal strip of width δx metre in this side, situated at a depth of x metre from the surface of water. Find the force by the water on this strip. (c) Find the torque of the force calculate in part (b) about the bottom edge of this side. (d) Find the total force by the water on this side. (e) Find the total torque by the water on the side about the bottom edge. Neglect the atmospheric pressure and take g = 10 ms−2. An ornament weighing 36 g in air, weighs only 34 g in water. Assuming that some copper is mixed with gold to prepare the ornament, find the amount of copper in it. Specific gravity of gold is 19.3 and that of copper is 8.9. Let mAu and mCu be the masses of gold and copper, respectively. Now, let the volume of the ornament in cm be V.
Thus, we have:V×ρw×g=2×g⇒(vAu+vCu)×ρw×g=2×g ρw=Density of water⇒mAuρAu+mCuρCuρw×g=2×g⇒mAu19.3+mCu8.9×1=2⇒ 8.9 mAu+19.3 mCu=2×19.3×8.9 =343.54 …(ii)From (i) and (ii), we get:8.9 (mAu+mCu)=8.9×36⇒8.9 mAu+8.9mCu=320.40 …(iii)From (ii) & (iii), we get:10.4 mCu=23.14⇒mCu=2.225 gmTherefore, the amount of copper present in the ornament is 2.2 gm. Refer to the previous problem. Suppose, the goldsmith argues that he has not mixed copper or any other material with gold, rather some cavities might have been left inside the ornament. Calculate the volume of the cavities left that will allow the weights given in that problem. A metal piece of mass 160 g lies in equilibrium inside a glass of water. The piece touches the bottom of the glass at a small number of points. If the density of the metal is 8000 kg m−3, find the normal force exerted by the bottom of the glass on the metal piece. â€‹Let R be the normal reaction and U be the upward thrust. A ferry boat has internal volume 1 m3 and weight 50 kg. (a) Neglecting the thickness of the wood, find the fraction of the volume of the boat immersed in water. (b) If a leak develops in the bottom and water starts coming in, what fraction of the boat’s volume will be filled with water before water starts coming in from the sides? (a) Let V1 be the volume of the boat inside the water. It is equal to the volume of the water displaced in m3. mg=V1×ρw×g⇒50=V1×103⇒V1=5100=0.05 m3(b) Let V2 be the volume of the boat filled with water before water starts coming in from the side. A cubical block of ice floating in water has to support a metal piece weighing 0.5 kg. Water can be the minimum edge of the block so that it does not sink in water? Specific gravity of ice = 0.9. Let x be the minimum edge of the ice block in cm. A cube of ice floats partly in water and partly in K.oil. Find the ratio of the volume of ice immersed in water to that in K.oil. Specific gravity of K.oil is 0.8 and that of ice is 0.9. A cubical box is to be constructed with iron sheets 1 mm in thickness. What can be the minimum value of the external edge so that the cube does not sink in water? Density of iron = 8000 kg m−3 and density of water = 1000 kg m−3. Let x be the external edge of iron. A cubical block of wood weighing 200 g has a lead piece fastened underneath. Find the mass of the lead piece which will just allow the block to float in water. Specific gravity of wood is 0.8 and that of lead is 11.3. The cubical block floats in water. Solve the previous problem if the lead piece is fastened on the top surface of the block and the block is to float with its upper surface just dipping into water. A cubical metal block of edge 12 cm floats in mercury with one fifth of the height inside the mercury. Water in it. Find the height of the water column to be poured. Specific gravity of mercury = 13.6. 15th of the cubical block is inside mercury initially. ρbbe the density of the block in gm/cc. ∴(x)3×ρb×g=(x)2×x5×ρHg×g⇒(12)3×ρb×g=(12)2×125×13.6⇒ρb=13.65 gm/ccLet y be the height of the water column after the water is poured. A hollow spherical body of inner and outer radii 6 cm and 8 cm respectively floats half-submerged in water. Find the density of the material of the sphere. ρ and the volume of the water displaced by the hollow sphere be V.
A solid sphere of radius 5 cm floats in water. If a maximum load of 0.1 kg can be put on it without wetting the load, find the specific gravity of the material of the sphere. Let the weight of the sphere be W1 and the weight of the load be W2. Here, U is the upward thrust. Find the ratio of the weights, as measured by a spring balance, of a 1 kg block of iron and a 1 kg block of wood. Density of iron = 7800 kg m−3, density of wood = 800 kg m−3 and density of air = 1.293 kg m−3. A cylindrical object of outer diameter 20 cm and mass 2 kg floats in water with its axis vertical. If it is slightly depressed and then released, find the time period of the resulting simple harmonic motion of the object. When the object is depressed into water, the net unbalanced force causes simple harmonic motion. Let x be the displacement of the block from the equilibrium position. Driving force=U=VρwgHere,U is the upward thrust.V is the volume.ρw is the density of water. Thus, we have:ma=πr2(x)×ρwga=πr2ρw9x2×103T=2πDisplacementAcceleration =2π(x)×2×103πr2ρwg(x) =2π2×103π×(10)2×1×10 =2π2π×10=0.5 sTherefore, the required time period is 0.5 second. A cylindrical object of outer diameter 10 cm, height 20 cm and density 8000 kg m−3 is supported by a vertical spring and is half dipped in water as shown in figure. (a) Find the elongation of the spring in equilibrium condition. (b) If the object is slightly depressed and released, find the time period of resulting oscillations of the object. The spring constant = 500 N m−1. Here, U is the upward thrust and x is the small displacement from the equilibrium position. ⇒500×103×(x)+πr2×h2×1×1000=πr2×h×ρb×1000⇒500×103×(x)= πr2×h×1000ρb-12=π×(5)2×20×1000ρb-12⇒50x=π×25×2×ρb-12x=π(8-0.5)or, x=π×7.5=23.5 cm(b) We know that X is the displacement of the block from the equilibrium position. A wooden block of mass 0.5 kg and density 800 kg m−3 is fastened to the free end of a vertical spring of spring constant 50 N m−1 fixed at the bottom. If the entire system is completely immersed in water, find (a) the elongation (or compression) of the spring in equilibrium and (b) the time-period of vertical oscillations of the block when it is slightly depressed and released. (b) As the system is inside the water, the unbalance force will be the driving force, which is kx for SHM. Hence, there will be no change in the buoyant force. A cube of ice of edge 4 cm is placed in an empty cylindrical glass of inner diameter 6 cm. Assume that the ice melts uniformly from each side so that it always retains its cubical shape. Remembering that ice is lighter than water, find the length of the edge of the ice cube at the instant it just leaves contact with the bottom of the glass. Let the length of the edge of the ice block when it just leaves contact with the bottom of the glass be x and the height of water after melting be h.
A U-tube containing a liquid is accelerated horizontally with a constant acceleration a0. If the separation between the vertical limbs is l, find the difference in the heights of the liquid in the two arms. Let a0 be the acceleration with which U-tube is accelerated horizontally. So, the horizontal part will experience some inertial force. At Deoprayag (Garwal, UP) river Alaknande mixes with the river Bhagirathi and becomes river Ganga. Suppose Alaknanda has a width of 12 m, Bhagirathi has a width of 8 m and Ganga has a width of 16 m. Assume that the depth of water is same in the three rivers, Let the average speed of water in Alaknanda be 20 km h−1 and in Bhagirathi be 16 km h−1. Find the average speed of water in the river Ganga. Here, VA, VB and VG be the average speeds of water in Alaknanda, Bhagirathi and Ganga, respectively. Water flows through a horizontal tube of variable cross section. The area of cross section at A and B are 4 mm2 and 2 mm2 respectively. If 1 cc of water enters per second through A, find (a) the speed of water at A, (b) the speed of water at B and (c) the pressure difference PA − PB. The areas of cross-sections of the tube at A and B are 4 mm2 and 2 mm2, respectively. 1 cc of water enters per second through A. Suppose the tube in the previous problem is kept vertical with A upward but the other conditions remain the same. the separation between the cross sections at A and B is 15/16 cm. Repeat parts (a), (b) and (c) of the previous problem. Suppose the tube in the previous problem is kept vertical with B upward. Water enters through B at the rate of 1 cm3 s−1. Repeat parts (a), (b) and (c). Note that the speed decreases as the water falls down. Water enters through B at the rate of 1 cm3s−1. Water flows through a tube shown in figure. The area of cross section at A and B are 1 cm2 and 0.5 cm2 respectively. The height difference between A and B is 5 cm. If the speed of water at A is 10 cm s−1 find (a) the speed at B and (b) the difference in pressures at A and B.
PA and PB are the pressures at A and B, respectively. hA and hB are the heights of points A and B, respectively. ρ is the density of the liquid. PB-PA=12×1(100-400)+1×1000(5.0) =-150+5000=4850 Dyne/cm2 =485 N/m2Therefore, the required pressure difference at A and B is 485 N/m2. Water flows through a horizontal tube as shown in figure. If the difference of heights of water column in the vertical tubes is 2 cm, and the areas of cross section at A and B are 4 cm2 and 2 cm2 respectively, find the rate of flow of water across any section. Now, let vA and vB be the speeds of water at A and B, respectively. hA and hB are the heights of water columns at point A and B, respectively. 12×1×4vA2-vA2⇒2×1×1000=12×1×3vA2[pA-pB=2 cm=2×1×1000 dyne/cm2 (water column)]⇒ vA2=40003=36.51 cm/s∴Rate of flow=vAaA=36.51×4=146 cm3/sHence, the required rate of flow of water across any section is 146 cm3/s. Water flows through the tube shown in figure. The areas of cross section of the wide and the narrow portions of the tube are 5 cm2 and 2 cm2 respectively. The rate of flow of water through the tube is 500 cm3 s−1. Find the difference of mercury levels in the U-tube. ρ is the density of the fluid. pA and pB are the pressures at A and B.
h is the difference of the mercury levels in the U-tube. Now,h×13.6×980=12×1×214(100)2 [Using (i)]⇒ h=21×(100)22×13.6×980×4 [∵pA-pB]=1.969 cmTherefore, the required difference is 1.969 cm. Water leaks out from an open tank through a hole of area 2 mm2 in the bottom. Suppose water is filled up to a height of 80 cm and the area of cross section of the tanks is 0.4 m2. The pressure at the open surface and at the hole are equal to the atmospheric pressure. Neglect the small velocity of the water near the open surface in the tank. (a) Find the initial speed of water coming out of the hole. (b) Find the speed of water coming out when half of water has leaked out. (c) Find the volume of eater leaked out using a time interval dt after the height remained is h. Thus find the decrease in height dh in terms of h and dt. (d) From the result of park (c) find the time required for half of the water to leak out. Pressure at the open surface and at the hole is equal to atmospheric pressure. 5×10-6∫0tdt=128∫0.80.4dhh=5×10-6×t=128×2h120.80.4=5×10-6×t=128×2h120.80.4⇒t=120×2×(0.4)1/2-(0.8)1/4×15×10-6⇒t=14.47×2×23.16×15×10-6×13600 h = 6.51 hThus, the time required to leak half of the water out is 6.51 hours. Water level is maintained in a cylindrical vessel up to a fixed height H. The vessel is kept on a horizontal plane. At what height above the bottom should a hole be made in the vessel so that the water stream coming out of the hole strikes the horizontal plane at the greatest distance from the vessel. It is given that H is the height of the cylindrical vessel. Now, let h be the height of the hole from the surface of the tank.